Hi.. Welcome to AYESHA'S KITCHEN. Here is the recipe of a sweet delicious dessert / payasam / kheer with one of my favorite fruits pine apple. Most of us prefer to have some sweet dessert / payasam after our meal. In Kerala, onam sadhya is incomplete without a payasam. 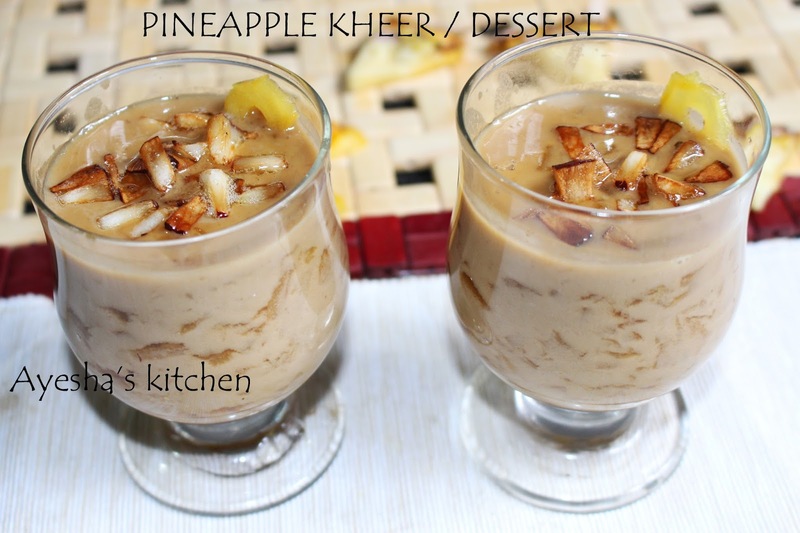 Pine apple payasam / dessert is a very tasty and refreshing dessert. The main ingredients used in this lovely dessert are pine apple, jaggery and coconut milk. I prefer jaggery instead of sugar as it gives a special flavor to the payasam. 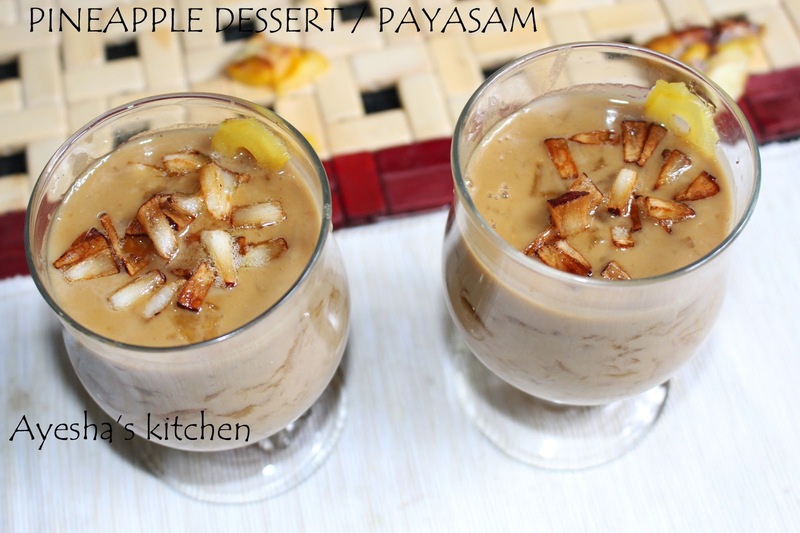 Do try this quick and yummy delicious payasam, You will love this for sure!!!! Heat a pan / vessel and add ghee. Roast the cashews and set aside. Then roast the coconut slices and set aside. Then add finely chopped pine apple pieces to the ghee, saute well and cook in a medium flame for 5 minutes. Next step is adding jaggery. If you are using jaggery blocks, you have to melt it in a separate vessel with some water and then drain it to remove impurities. Then add the drained melted jaggery to the pineapple mixture and mix well. Then add fried cashews, crushed cardamom and dried ginger powder ( chukk podi) along with a pinch of salt. Now add thin coconut milk and bring to boil. When it starts boiling, add thick coconut milk. Mix well and heat in a low flame for 5 minutes. Do not allow coconut milk to boil more.